Hey guys, Matthew Weiss here — theproaudiofiles.com and advancedmixing.com. 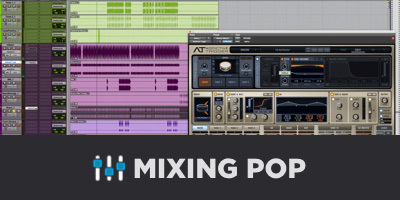 So I get a question fairly often that goes something to the extent of, what is the difference between mixing music that’s primarily based on program material and sequencing, versus music that is acoustically based, like Rock or Jazz? So you know, what’s the difference between EDM versus doing something like a Rock tune? And at the core of it, there’s no real exact difference. The idea is still the same in the sense that we’re trying to make the music do what the artist intends for it to do, but in terms of the actual workflow of it, and in terms of the exact nuance of it, they are actually very different. Different challenges that we run into very frequently, different ideas for what the aesthetic is going to be, and also different workflow and technique. So one of the things that I do when I’m doing acoustically based music that I wouldn’t do if I’m doing something like an EDM record, or a Hip Hop record, or something that’s based more on program material is configuring multi-buss techniques. So multi-buss techniques are techniques where we’re running different parallel and interacting auxiliary chains together. This has been really popularized by Michael Brauer’s setup. He’s famous for Brauer-izing a record, where instead of running subgroups that are based on the individual stem, he runs subgroups that are based on frequency content and role in a mix. It’s sort of a complicated setup, but you can check it out on his website, but what I’m going to do is show you a multi-buss technique that I very frequently do. So first, I’m going to play this record, this bit of this record, and then I’m going to break down what I’m doing and the multi-buss technique that I very frequently do in this style of music. So, what we have here is the rhythm sections of the record. This is the backbone of everything. So there’s not really any leads here, but we have this Prophet synthesizer, we have all of these different percussion tracks like shakers and bongos and things like that, and we have the bass and we have the drums, and collectively, they all make up the rhythm element of the record. Now, this is going to vary from song to song. Sometimes, there’s going to be records that have rhythm guitar parts. It’s basically anything that’s making up the background groove in which all of the leads go on top of. That’s all coming down to this rhythm aux track here. So all of my percussions will come down to a subgroup, but then that subgroup will come down to another subgroup called rhythm, and the same thing with the drums. The drums will go down to a subgroup for just the drums, but then subgroup for the drums is also coming to the rhythm track. So all of the different rhythm elements are coming down and converging into this one subgroup here, which means that I can take the entire rhythm track, all at once, and affect everything. So if I feel like there’s not enough grove, or not enough dynamic, or it needs to all come up, or it needs to all come down, it can all be affected right here on this subgroup. Now, from this subgroup, I have two other parallel channels. One is one that I call fat, and the other one is one that I call crush, and they come off of the rhythm sections. So all of these different rhythm elements are being affected and modified together, and then they come in to support the other elements. So these two things do exactly what they sound like. This one is intended to make the feel of the rhythm section thicker. So give it a little more girth, a little bit more weight, and then the crush section is to give it attitude and aggression. Something that’s going to make it stand out and punch through. Now, how you would choose to set this up, how you would choose to implement that, that’s really something that as the mixer, you can choose to do artistically. You go with what works for you. So for me, something that I very frequently found myself doing for the fat track, I start with an EQ, and I’m boosting about 4dB at 100Hz. Now, again, these settings might change from time to time, the choice of EQ might change, depending on what I’m trying to do, but the bottom line is I’m starting off by giving everything that’s in the rhythm subgroup a boost in the low end. From there, I’m using Kush Audio UBK-1 here, and I’ve got it — it’s on crush mode, but it’s set in a way where it’s not really crushing things, it’s actually letting a good amount of transient through, but more importantly, you see this high pass filter on the side-chain detector of the compressor is letting all of the low end through. So everything under 500Hz is not triggering the compressor. That’s really important for this particular channel. Then the last little bit on this fat channel is a bit of distortion that tends to emphasize the low end. If you’re seeing a theme here, it’s that all three of these plug-ins are doing something that emphasizes the low end. So what I’m going to do is I’m going to mute up my other channels here, and you’re going to hear just the return on my fat channel. So here’s my rhythm channel. So you can hear, it’s a lot more low end-y, it’s obviously a lot more compressed and pumpy, and when the two come together, it sounds like this. So, not only does it put a lot of low end in there, but it puts it in a very gluey, grooved low end. Like, it has movement to it, and that’s really important to the ideology behind doing this sort of a technique. Now, I’m going to play for you a crush track. The crush track is sort of the opposite. This is where the aggression is coming from, so I’m not only boosting the low end by about 4dB, but I’m also boosting the top end by about 4dB, and that’s right in front of the compression that I’m using, and I really like the SoundToys Devil-Loc a lot for this, because it is a super ridiculously aggressive compressor. It’s basically a distortion box that starts with like, pretending to be a compressor, and then very quickly becomes distortion, and it sounds like this. So you can hear that it’s squaring off the kick. You can hear that it’s really flattening everything and has this very crunchy and sort of chewy quality to it, and I really don’t find that I need too much of this, even if I’m tucking it down way low. I mean, it adds a lot of level in its own process, so the fact that it’s turned down 30dB is not indicative of — it’s not accurate to how hot the level is. But I mean, it really doesn’t take too much of it. So that’s going to be in the background, and here is before and after. So you hear, it gets a lot more sizzle-y, it gets a little bit of an extra bit of aggression and harmonic color to it, and that’s really all that’s meant for. Then of course, when I combine them all, it sounds like this. So, once I’ve got that setup and I’ve got it dialed in the way that I like it, I can use these send faders here to make sure that the right amount of level is going to them. If I want a little bit less of the aggression from the crush track, for example, I would back off the level send. If I want a little bit more of a dynamic feel in the low end, I would back off the fat send, and then I could adjust the level coming back to turn it up. So if I send less level of the rhythm elements into it, then less compression ends up happening, and then I can push it up again. We can hear that’s a more open sound. There you feel the sense of compression a little bit more, because there’s more level being sent in. So once I get it setup, and I’ve got basically what I’m trying to do going, I mix through it, and that’s really important, because the levels start to become more apparent in terms of where everything needs to fit to feel right, because I’m not just purely adjusting level anymore, I’m also changing the harmonic color because I’m running more or less level of any individual instrument into this group, and I’m adjusting the feel of the dynamic, because it’s causing more or less compression, depending on whether or not I’m turning things up or down, and I’ll give you a quick example of that. Right. You hear those little inside notes a lot more clearly when I start pushing up the Prophet return, because of the way it’s interacting with the compressor. Those little inside notes are happening during the off beats, and so they become a lot more clear, even though the compressor is working, and similarly, if I were to do something like push up the drums, you would hear those inside notes come out as well. You also hear the cymbal hang on a little bit more when I push up the level. That “tssss” kind of a noise. So that’s why I like to mix through it, because it gives me a better idea of how the feel is interacting and everything like that. Then if I want to make further adjustments, then I do it from the send channels and from the returns themselves. Lastly, the other reason why this is a cool technique is because, let’s say I want more low end on the rhythm section, or let’s say I want more mid-range or something like that. If I affect the rhythm channel, it also affects the fat channel and the crush channel, and so it keeps them all working together in the same way. So it’s a bit of a workflow technique and approach, but this is something that’s kind of personal. You experiment with it, you figure out what you want to do. I do recommend setting up something like a fat track and a crush track. 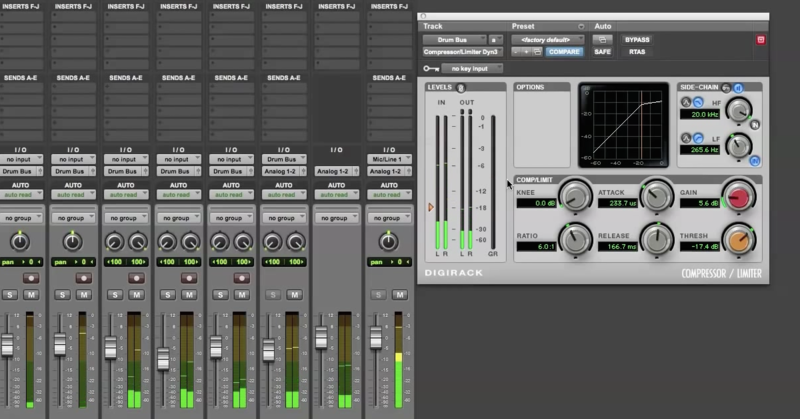 I find that works pretty ubiquitously, but you might want to try it using different types of reverb sends, you might want to try it using a distortion box of some sort on the parallel channel, you might want to try it using multiple styles of compression, like maybe you want one where you have very slow attack and very fast release, and then another one where you do very fast attack, very slow release, and then you find the blend that kind of works. There’s a lot of different ways that you can approach this, and it’s a good spot where you can get creative, where you can kind of find something that you like that’s personal to your style of mixing, and I really think that anything that allows you to develop your sound and play to your own aesthetic is something that’s going to elevate your desirability in the competitive world of mixing, and also just make things more enjoyable and more fun. Alright guys, I know this was a bit long, but I think it’s a good one. I hope that you learned something. Until next time.